This year I resolved to learn more about Italian wine. My education in that direction still leaves a lot to be desired, but I have enjoyed the process so far. As part of my mission I bought a mixed case of Italian wine from The Wine Society using the sole criterion that they were wines I knew little about, with the intention of presenting them to my local tasting group. They turned out to be a lot better than I could have hoped for, and I am describing a couple of the wines here. They are the ones I enjoyed most from the selection, and the ones I bought more of, but the main reason I am blogging about them is because I find them so fascinating. They both happen to come from Sicily. Prior to this experience, the only Sicilian wines I remember trying were some good but very international varietals from Planeta. Oh, and Donnafugato’s Ben Ryé, which was also good, but in my opinion expensive and over-rated. In contrast, the wines described below opened up a whole new world for me. I shared a whole bottle of each of these vintages with food. The first one was bought for the tasting, but never made it that far as I needed to cut back on the number of wines to show. I got the 2009 because I liked the 2008 so much, and at the time Joseph Barnes was the only merchant in the UK claiming to stock it – but as it turned out they had moved on to the 2009 too. The 2008 got “one glass” in Gambero Rosso’s Italian Wines 2011. 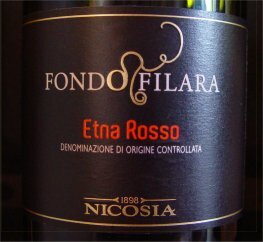 This wine is 60% Nero d’Avola and 40% Frappato di Vittoria. The grapes are those of Cerasuolo di Vittoria DOCG, so I am not sure why this is a mere IGT. It is very trendily fermented and matured in terracotta amphorae, unfiltered and has low sulphur – a natural wine I guess, but I will not hold that against it. The 2008 has 13.5% on the label, and the 2009 12.0%. Whether that reflects the vintages, or is rather a labelling artifact, I wouldn’t like to say. I did not notice a huge vintage variation in terms of body, but my notes did differ in other respects. I tried this at the tasting, and subsequently shared another bottle bought from The Wine Society with food. 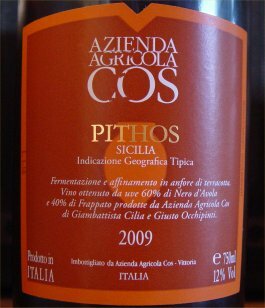 Yesterday I ordered a case from Fresco di Vigna in Sicily – the only source according to wine-searcher. It will be interesting to see how successfully my purchase arrives. Even including €40 shipping it worked out about £1 per bottle cheaper than The Wine Society. This wine got “2 glasses” in the same edition of Gamero Rosso. This entry was posted in My tasting notes and tagged italy, tasting, tasting note. Bookmark the permalink.